BKLYN Designs is underway! The toyChaise, designed by Lisa Albin of Iglooplay will be on exhibition at the amazing design show this weekend. We’re thrilled about the eco-friendly children’s furniture literally coming out of the woodwork for BKLYN Designs, and we know the toyChaise would fit handily and beautifully into the repertoire of adults and children alike. 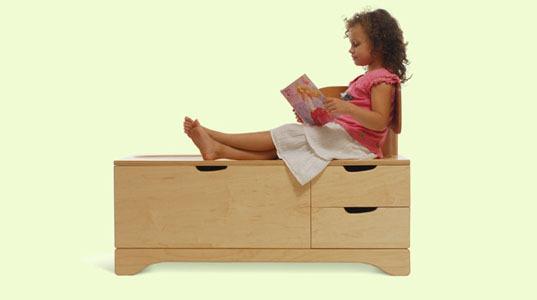 “We’re all looking for more storage,” begins the description on the Iglooplay website, with regard to the toyChaise. It’s a knowing quote almost no city parent will disagree with, as multifunctional children’s furniture is prized by urbanites seeking to make the most of their limited apartment space. BKLYN Designs is underway! The toyChaise, designed by Lisa Albin of Iglooplay will be on exhibition at the amazing design show this weekend. We're thrilled about the eco-friendly children's furniture literally coming out of the woodwork for BKLYN Designs, and we know the toyChaise would fit handily and beautifully into the repertoire of adults and children alike.